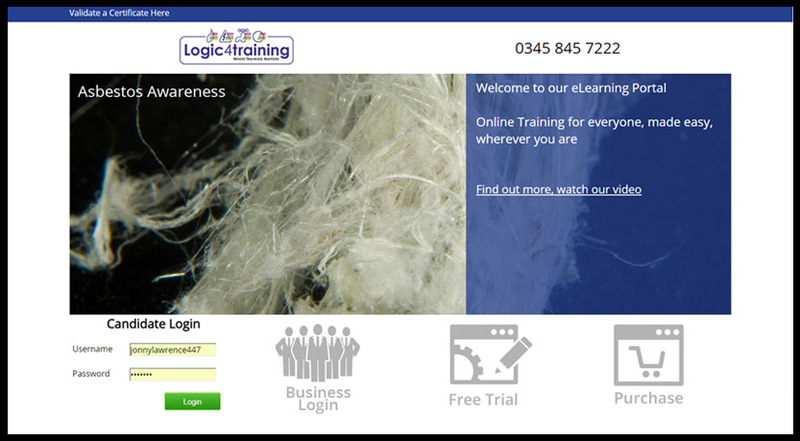 Logic4trainings online health and safety courses are great for business’s looking to train several employees at a low cost, as well as individuals with specific requirements like asbestos or Legionella awareness training. Our courses save time and money due to the fact that they can be taken anytime, so employees won’t have to take time off to undertake lengthy, often tedious training. Successful candidates receive a recognised qualification in the form of a printable certificate. All of the online courses are video based. Your video tutor will guide you through what is required, provide you with the learning material and then ask you the questions. 1. 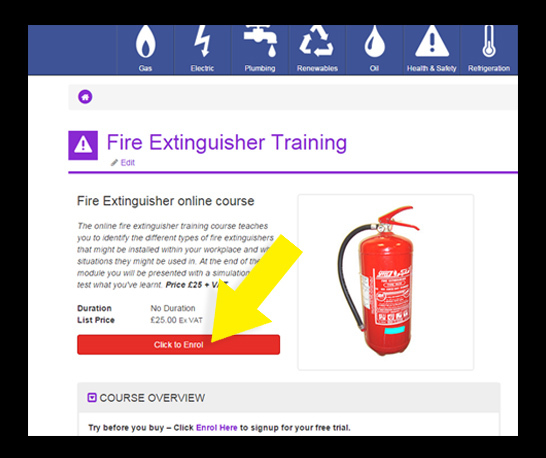 To enrol on one of our Health & Safety courses simply click on a course and then “Click to Enrol” (see below). 2. You will go through to the Health & Safety “dashboard”. Here you can login if you have an account, select a free trial or Purchase a course. If you are here for the first time you will be prompted to create an account when you choose a purchase or a free trial. 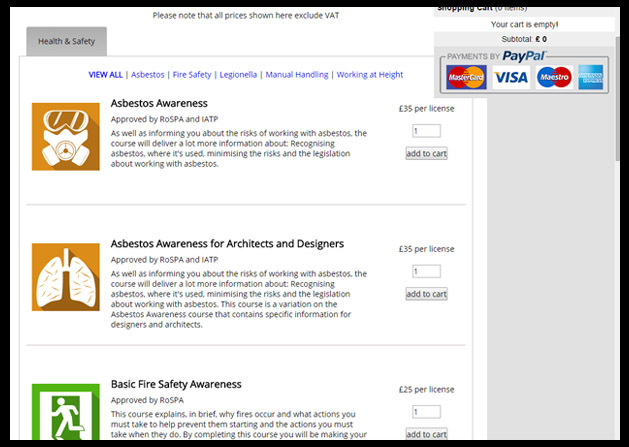 You can add as many courses as you like to your cart (which appears top right of your screen) and can make a secure payment using your card or PayPal. If you have trouble with the payment or think something has gone wrong please call us on 0345 845 7222. 4. 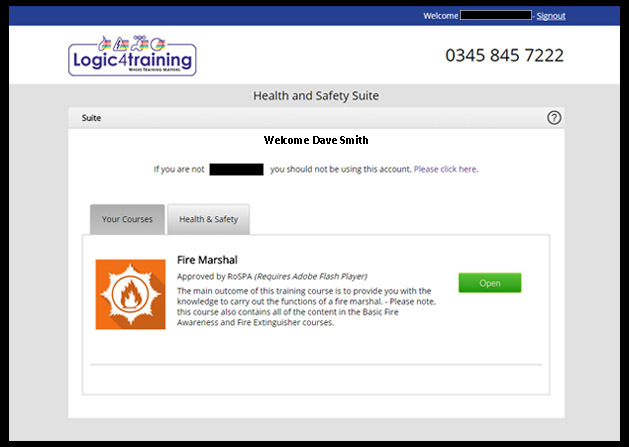 Once you have made a purchase or started a Free trial you will have access to your own “Health and Safety Suite”. From here you can select the courses you have access to or purchase more. Courses take between 2 and 6 hours to complete but are split into modules which can be taken individually and at a pace the candidate is comfortable with. Your video tutor will explain how each course works, with pass requirements and further instructions presented clearly. If you do get stuck however, please call our customer service team on 0345 845 7222 and we will be happy to help. If you would like more information on our online health and safety courses visit the Health and Safety section of our site – Click Here.